GrabHitch is a non-commercial social carpooling service that matches everyday drivers (like you!) with riders who are going along the same way. This incentive is only eligible for new drivers who sign up and successfully complete their 1st ride as a Grabhitch Driver by 31 August 2018@23:59. 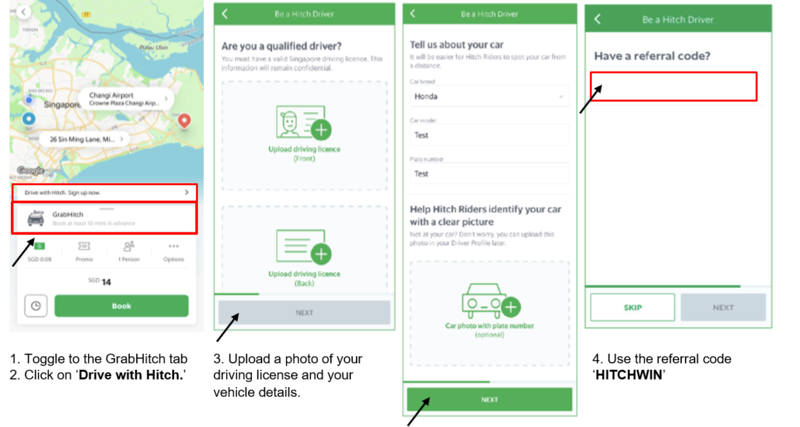 New drivers must sign up with ‘HITCHWIN‘ as the referral code in order to qualify for the $20 reward and 1 chance to win in the Weekly and Grand Draw of Lucky Draw Contest. The processing of the $20 will only be conducted after the incentive period has ended (i.e. post 31 August 2018). Please allow up to 10 working days from the end of the incentive period for the disbursement of the $20 reward into your Hitch Driver wallet.